SIRONA was designed by Bill Tripp and built with composite construction methods in 1999 by Marten Yachts. She was meant for world cruising and performance, and easily reaches sailing speeds up to 20 knots. SIRONA underwent an extensive refit in 2016 at New England Boatworks. She has an overall length of 72 feet and a beam of 16.7 feet. A custom designed lifting keel allows SIRONA to cruise waters or glide in an anchorage close to shore. Designed with a low center of gravity, SIRONA is highly stable and lightweight, allowing for smaller sails, higher hull speed and lower loads, resulting in more time to enjoy the sailing. The Tripp design includes a raised pilot saloon which allows for comfortable sailing in any weather. The raised saloon features interior steering & lounging areas and excellent panoramic visibility. The pilot house shelters the cockpit which is surrounded by dual coaming. A twin headsail system provides the right sail angles at all wind speeds and allows SIRONA to reach her sailing potential without the need to change sails. A fully battened mainsail sits in a "gull wing" boom enables ease of handling. Stepping below from the pilot saloon to the lower saloon, there is a bar to to starboard, a dining area to port and a forward galley. Two cabins and a guest head are forward and the master with private head is aft. Engine room sits amidships below the cockpit & pilothouse and a hydraulic transom door opens for storage. Master Cabin with King and sette which can be a bunk for a child. Lower salon converts to double. Port forward single bunks. Stbd forward Queen size with private head.in 2018, yacht converted the lower settee into a lounge / sleeping area. Boat can accommodate 8 aboard (1)Couple in Master State room with young child on small bunk(1)Couple in forward state room. (2)Crew in bunks on Port side(3)or more kids sleep on lower settee. 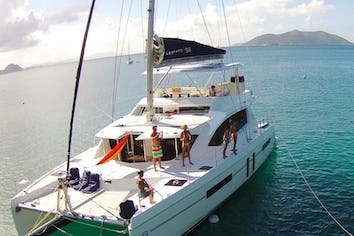 yacht accommodates 6 adults with crew. We often cruise with 2 families – there is an extra bunk in the main cabin + the new ‘crash pad / reading nook’ at the lower salon which is fitted with a privacy curtain. This is a nice queen which will sleep a couple or 3 kids. 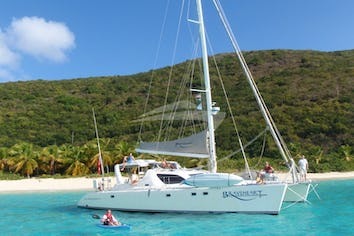 Yacht must have at least a Dive Master or Dive Instructor on board to offer diving. 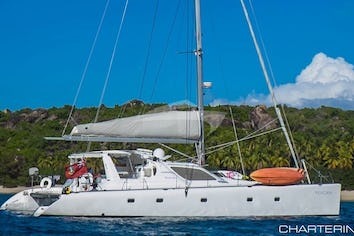 Victoria has been sailing for the last three years on an aggressive track deep into the world of yachting. Always an adventurer, whether it be backpacking Europe or camping the Alaska wilderness, she knows how to have fun no matter what the situation. With 18 years of experience, her primary background is as a labor/ delivery and pediatric nurse. She is extremely nurturing by nature, but not afraid of difficult situations, people’s health and safety are always at the top of her priorities list. Victoria knows life is all about balance, and this is reflected in the wholesome, tasty meals she prepares using fresh local ingredients. Family friendly yacht & crew!